Oxford Showfolio Laminated Portfolios OXF51705 $25.59 Portfolios are made of distinctive high gloss laminated cover stock to resist soil and moisture. 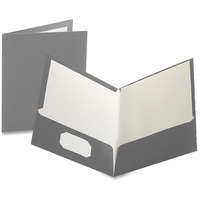 Twin pocket folders have generous, twin wing style pockets that hold 100 sheets of letter size loose papers. Each folder has a die cut, business card holder on inside left pocket.